Elephant numbers are dwindling, with over 100.000 elephants being killed in Africa between 2010 and 2012. Image via AP. Most societies in Africa are leading an uphill battle in their attempt to ensure safety, good health and food security. But for African animals, it’s even worse. Poachers alone killed an estimated 100,000 elephants across Africa between 2010 and 2012, raising new concerns about the species’ survival. Poaching in Africa is huge – the term ‘crisis’ has rarely been used more appropriately. The unprecedented spike in illegal wildlife trade, threatens to overturn what conservation efforts were slowly starting to achieve in the past decades. For example, although there is no scientific proof of its medical value, rhino horn is highly prized in traditional Asian medicine, and due to this, rhinos are now on the brink of extinction. Recent estimates show that if current trends continue, rhinos could go extinct by 2020. Let me phrase that in a different way, so you can get a better sense of the absurdity – one of the world’s most iconic species will likely go extinct in our lifetime, for a “medicinal” property which it doesn’t even have! The Western Black Rhino is was already driven to extinction, and soon, its relatives could follow. 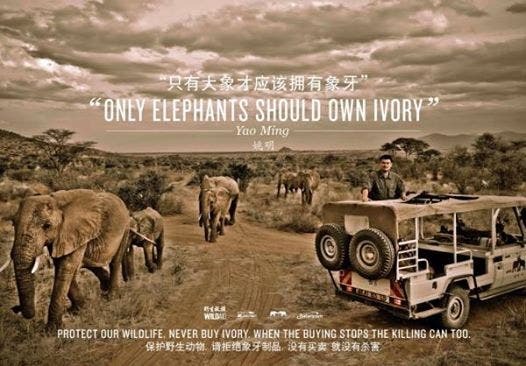 WIldAid teamed up with Chinese basketball player Yao Ming for this campaign against ivory trade. As you will probably guess, elephants are hunted for the ivory. Again, we’re dealing with one of the most iconic and well known species on the face of the Earth. A species known for its intelligence, kindness and ability to cooperate is being wiped out to be old as body parts, mostly on the Chinese black market. While the rhino horn has reached a mind blowing price of $30,000 per pound (almost $14,000 per kilo), ivory is estimated at $1,000 per pound (over $2,000 per kilo) – a huge price, especially when considering that no one actually needs an elephant’s tusk – except himself. Warnings about massive elephant slaughters have been going on for years and years now, but until now, there has been no study to quantify the effects of massive poaching. Keep in mind, poaching in Africa is not one or a few guys with guns going out to kill elephants. Poaching has become so organized and well funded, that we’re talking about well organized criminal organizations and even militia. The study found that the proportion of illegally killed elephants has climbed from 25 percent of all elephant deaths a decade ago to roughly 65 percent of all elephant deaths today, a trend which if continued, will lead to the complete wipe of the species. All in all, they found that over 100.000 elephants have been killed between 2010 and 2012, and the number is continuously growing. 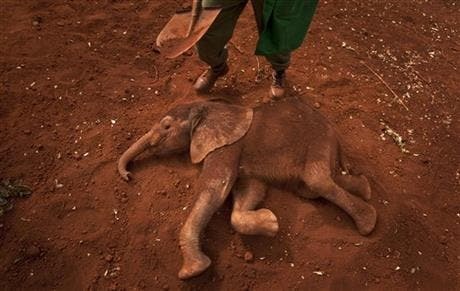 Two-month-old orphaned baby elephant Ajabu is given a dust-bath in the red earth after being fed milk from a bottle by a keeper, at the David Sheldrick Wildlife Trust Elephant Orphanage in Nairobi, Kenya. 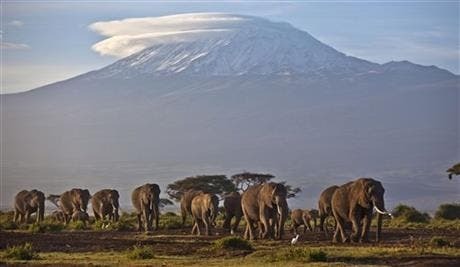 A new study released Monday Aug. 18, 2014, by lead author George Wittemye of Colorado State University, found that the proportion of illegally killed elephants has climbed to about 65 percent of all elephant deaths. Image via AP. It’s estimated that there are as many as 700,000 elephants in Africa, but this is the total of two different species: the African bush elephant and the smaller African forest elephant. However losing either, but especially both, would be a major loss to the ecosystems and tourist economies throughout Africa. Unfortunately, the numbers for the Asian elephant are much smaller. Early this year, nearly 450 elephants were slaughtered in Cameroon’s Bouba N’Djida National Park, representing close to 10% of the country’s remaining elephant population, but that’s nothing! Tanzania’s Selous Game Reserve dropped from 40,000 to 13,000 over the last three years. Botswana seems to be the only place where elephant populations have maintained stable or increased, but that’s only because poachers haven’t yet started their activities there – which they almost definitely will in the near future. As mentioned earlier, China is the main demand market for the ivory. Chinese Ambassador in Kenya Liu Xianfa is aware of this, and he claims efforts are being made to limit the damage. 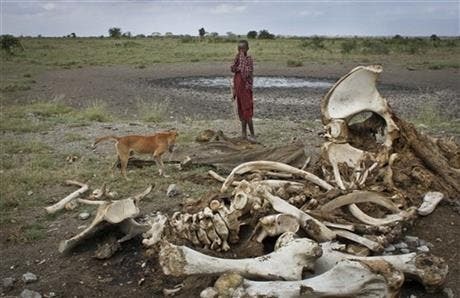 In this Wednesday, Feb. 13, 2013 file photo, a Maasai boy and his dog stand near the skeleton of an elephant killed by poachers outside of Arusha, Tanzania. Image via AP. Elephants also survived a massive poaching crisis in the 1970s and 1980s, when Japan fueled the demand for ivory. In 1989 the Convention of the International Trade of Flora and Fauna (CITES) abandoned attempts at regulation and passed a ban on international trade in ivory. Japan has since greatly reduce its ivory market, and initially, the law was a huge success, but legal ivory sales made way for illegal ivory sales… and here we are.